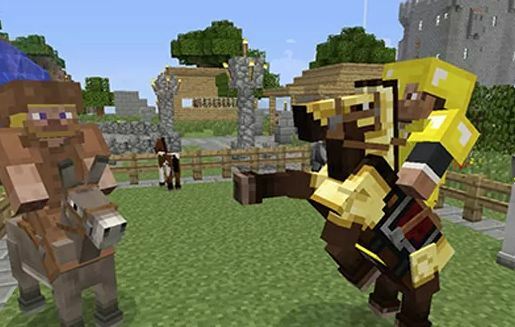 How to Tame a Horse in Minecraft – Minecraft in its Xbox editions and PlayStation recently received an update that added horses, mules, and donkeys to the game, allowing users to find the wild animals and turn them into their own mounts. Check out this tutorial how to tame them. Horses provide a fast transport in Minecraft, both for its speed of movement and for its ability to pass through small heights of blocks without having to jump. Different types of horses have their own attributes, and may even have large jumps of five blocks in height. Step 1: You will need a free slot for your items and a saddle, which can be obtained in chests scattered throughout the game or purchased by Emeralds with Villagers. Step 2: Find a horse. They usually stay in the lowland and savanna biomes in groups of two to six horses, and may also contain burros, which are rarer. Step 3: Approach a horse, select the free slot to have no items in hand and press the left trigger to mount it. Step 4: Wait a little bit because it will probably resist and after a few moments you will automatically leave it. Step 5: Repeat the process until you see hearts, which will indicate that it is tamed. Note: Certain foods increase the chance of taming horses, such as sugar, wheat, apples, golden carrots, and golden apples. Step 6: Once the horse is tamed, press the button normally used to open your inventory and you will be presented with the horse’s inventory screen. Step 7: Equip him with a saddle so you can control him. There is also space for armor specific for horses, but it is not mandatory. Step 8: To exit the horse just lower it by pressing the analog right in (D-Pad down on the PS Vita ). Step 9: Build a fencing to guard your horse when you are not around. Do not just attach it to a collar, it will disappear. Step 10: Use foods like sugar, wheat, apples, golden carrots, golden apples and blocks of hay to regain their energy when needed.